The Ecological Footprint is a resource accounting tool used widely as a management and communication tool by governments, businesses, educational institutions and NGOs to answer a specific resource question: How much of the biological capacity of the planet is required by a given human activity or population? What does the Ecological Footprint measure? The Ecological Footprint measures the amount of biologically productive land and sea area an individual, a region, all of humanity, or a human activity requires to produce the resources it consumes and absorb the carbon dioxide emissions, and compares this measurement to how much land and sea area is available. Biologically productive land and sea includes area that 1) supports human demand for food, fiber, timber, energy and space for infrastructure and 2) absorbs the carbon dioxide emissions from the human economy. Biologically productive areas include cropland, forest and fishing grounds, and do not include deserts, glaciers and the open ocean. Current Ecological Footprint Standards (www.footprintstandards.org) use global hectares as a measurement unit – which makes data and results globally comparable. You’ve probably heard of the Ecological Footprint - the metric that allows us to calculate human pressure on the planet and come up with facts, such as: If everyone lived the lifestyle of the average American we would need 5 planets. How much land area does it take to support your lifestyle? Take this quiz to find out your Ecological Footprint, discover your biggest areas of resource consumption, and learn what you can do to tread more lightly on the earth. Which Footprint calculator should I use? There are a number of online Ecological Footprint calculators in use today. When evaluating other Ecological Footprint calculators, the most important consideration is whether the calculator is actually measuring the Ecological Footprint and not just using the term footprint as a proxy for general environmental impact. These calculators may offer interesting insights but they are not aligned with the international Ecological Footprint Standards, which were adopted in 2006 in order to ensure that Footprint studies were both credible and consistent. The Ecological Footprint as defined by the Ecological Footprint standards calculates how much biologically productive area is required to produce the resources required by the human population and to absorb humanity's carbon dioxide emissions. Approximately 90 percent of all leading Ecological Footprint practitioners worldwide have joined Global Footprint Network and have agreed to adhere to these standards and to use a common set of data. For globally comparable and credible Ecological Footprint calculator results, look for transparent information on the methodology used, and check to see if the calculator was created by a Global Footprint Network partner, as partnership requires compliance with Ecological Footprint standards. Biocapacity is shorthand for biological capacity, which is the ability of an ecosystem to produce useful biological materials and to absorb carbon dioxide emissions. Overshoot, which in this context is shorthand for ecological overshoot, occurs when a population’s demand on an ecosystem exceeds the capacity of that ecosystem to regenerate the resources it consumes and to absorb its carbon dioxide emissions. How is an Ecological Footprint calculated? Ecological Footprints can be calculated for individuals, groups of people (such as a nation), and activities (such as manufacturing a product). The Ecological Footprint of a person is calculated by considering all of the biological materials consumed and all of the carbon dioxide emissions generated by that person in a given year. All these materials and emissions are then individually translated into an equivalent number of global hectares. To accomplish this, the amount of material consumed by that person (tonnes per year) is divided by the yield of the specific land or sea area (annual tonnes per hectare) from which it was harvested, or where its waste material was absorbed. The number of hectares that result from this calculation are then converted to global hectares using yield and equivalence factors. The sum of the global hectares needed to support the resource consumption and absorb their carbon dioxide emissions that person's Ecological Footprint. The Ecological Footprint of a group of people, such as a city or a nation, is simply the sum of the Ecological Footprint of all the residents of that city or nation. It is also possible to construct an Ecological Footprint of production for a city or nation, which instead sums the Ecological Footprint of all resources extracted and CO2 emissions generated within the borders of the city or nation. The Ecological Footprint of an activity, such as producing a good (an airplane) or service (providing insurance) in the human economy, is calculated by summing the Ecological Footprint of all of the material consumed and CO2 emitted during that activity. When calculating the Footprint of a business or an organization, the activities to be included within the boundaries of that organization must be clearly defined. What is a global hectare? A global hectare is a common unit that encompasses the average productivity of all the biologically productive land and sea area in the world in a given year. Biologically productive areas include cropland, forest and fishing grounds, and do not include deserts, glaciers and the open ocean. Using a common unit, i.e., global hectares, allows for different types of land to be compared using a common denominator. Equivalence factors are used to convert physical hectares of different types of land, such as cropland and pasture, into the common unit of global hectares. Global hectares can also be converted into global acres. What is the proper way to use the term Ecological Footprint? The term Ecological Footprint, capitalized, is a proper name referring to a specific research question: how much of the biological capacity of the planet is required by a given human activity or population? Often, the word ‘footprint’ is used generically to refer to human impact on the planet, or to a different research question. For example, the term ‘carbon footprint’ often refers to the number of tonnes of carbon emitted by a given person or business during a year, or to the tonnes of carbon emitted in the manufacture and transport of a product. There is a carbon component to the Ecological Footprint. It measures the amount of biological capacity, in global hectares, demanded by human emissions of fossil carbon dioxide. The term Ecological Footprint has been deliberately excluded from trademark to encourage its widespread use. Global Footprint Network strives to maintain the value of this term by encouraging our partners and others using the word footprint or Ecological Footprint to apply the term consistently, using the definition found in the Ecological Footprint Standards (www.footprintstandards.org). Global Footprint Network encourages research answering different questions to be referred to as something other than Ecological Footprint. How does the Ecological Footprint relate to carrying capacity? Carrying capacity is a technical term that refers to the maximum population of a species that a given land or marine area can support. Many species have easily defined and consistent consumption needs, making carrying capacity relatively easy to define and calculate. For humans, however, carrying capacity estimates require assumptions about future per-person resource consumption, standards of living and “wants” (as distinct from “needs”), productivity of the biosphere, and advances in technology. An area’s carrying capacity for humans is thus inherently speculative and difficult to define. Is the Ecological Footprint anti-trade, anti-technology, or anti-GDP? The Footprint tracks current human demand on nature in terms of the area required to supply the resources used and absorb the CO2 emitted in providing goods and services. Trade is accounted for by allocating this demand to the country that ultimately consumes these goods and services. This accounting reflects import and export flows, but makes no judgment regarding the benefits, disadvantages or fairness of trade. The Ecological Footprint is therefore neither pro- nor anti-trade. As new technologies come on line that affect biocapacity and resource-efficiency, their impact on resource supply and demand are reflected in biocapacity and Footprint assessments. In other words, the Footprint and biocapacity results reported in any given year are in part a function of the technology used in that year. This accounting does not judge whether the use of a technology is positive or negative, but only shows how the technology impacts resource flows. Footprint assessments are historical rather than predictive, and make no judgment about the value of technologies that may become available in the future. The Footprint approach is neither pro- nor anti-GDP. Gross Domestic Product (GDP) is an economic indicator used to track the annual value added to an economy. For a more comprehensive understanding of national trends, additional indicators are required--unemployment statistics, longevity figures, or ecological asset measures, for example. Global Footprint Network is working to have nations adopt the Ecological Footprint as a complement to, rather than as a substitute for, the GDP, and has set a specific goal in this regard--to have 10 nations adopt the Ecological Footprint by 2015 as a national indicator, in parallel with their use of the GDP. What is the Water Footprint, and how is it related to the Ecological Footprint? Though they are often compared and contrasted, Ecological Footprints and Water Footprints are, as indicators, fundamentally incapable of being substituted. The Ecological Footprint does not, and is not intended to measure freshwater flows. Because this is nevertheless a vital renewable resource, in 2002, A.Y. Hoekstra proposed that the Water Footprint be created as a sustainable water use indicator measuring the total volume of freshwater directly or indirectly used by a population. In essence, the Ecological Footprint measures the biological capacity a population uses and the Water Footprint measures the freshwater a population uses. 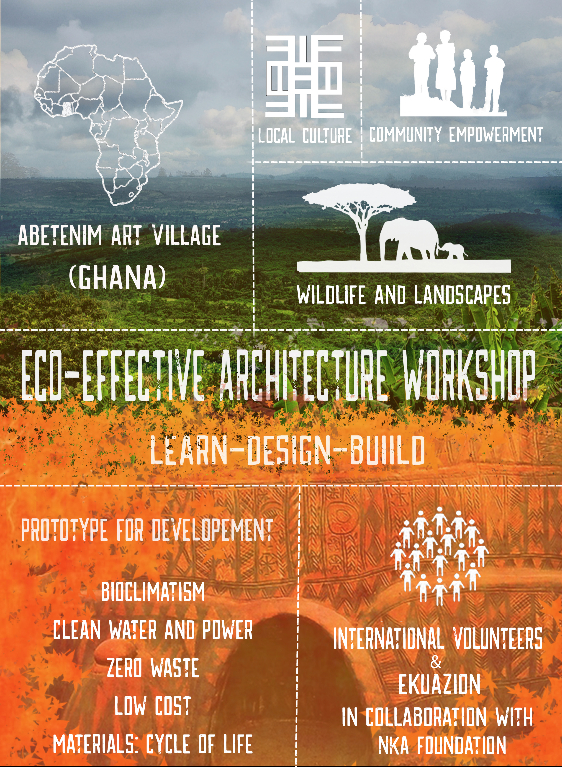 They each provide a different piece of information in the sustainability puzzle. Instead of being seen as competing metrics, they should be seen as two complementary indicators of natural capital use in relation to human consumption. 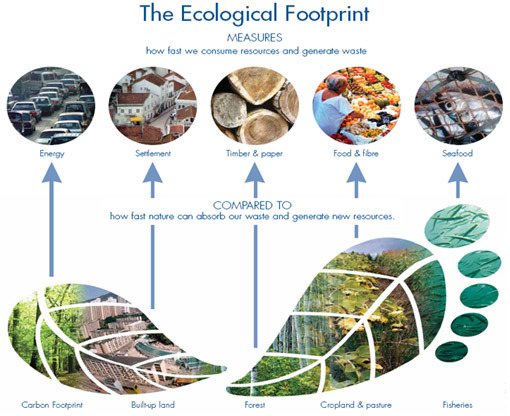 For more information on the similarities and differences between the Ecological and Water Footprints, please consult A.Y. Hoeksta's recent article Human appropriation of natural capital: A comparison of ecological footprint and water footprint analysis. Publicado por ekuazion en 1:27:00 p. m.